Bathroom flooring is not less important than the flooring setting of any other rooms in the house. When you choose flooring material for the bathroom, you should always take two main qualities into account: the material’s durability and its high resistance to water. Those qualities need to be considered in addition to the flooring style and design. There are various types of bathroom flooring available in the market, so it is not easy to choose the one that will suit you best. Luckily, here you can take a look at different bathroom flooring types and learn the strengths and weaknesses of each type. Put ceramic tiles on top of the list if you want to build a bathroom with classic design. 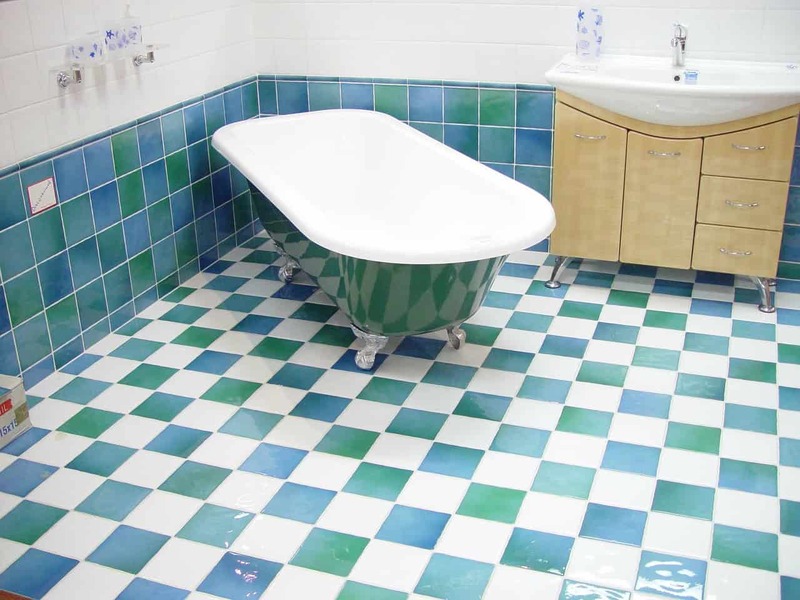 Ceramic is one of the most commonly used bathroom floorings which come with several advantages. It doesn’t only look good in general, but also durable and water resistant. However, this material needs to be cleaned regularly because it is quite easy to stain. Concrete is a real example in the modern types of bathroom flooring. This material can be used in the structural floor construction as well as at the top finished layer. It is also an excellent choice for cost-effective and eco-friendly material. One important thing to note: prevent any damage to the concrete flooring. If the floor is badly damaged, the replacement is difficult to install and may cost you a lot more money. Cork is an eco-friendly option for bathroom flooring. So if you want to have highly sustainable flooring, go for it. Also, this material is easy to install; you can even do it on your own. In spite of those benefits, cork flooring comes with a simple flaw: it is only resistant to moisture, but not waterproof. Engineering hardwood is equipped with dimensional stability, making it stronger and more durable than regular wood. The plywood base of this flooring material gives another advantage when it is in contact with water. However, just like most types of woods, engineering hardwood tends to damage gradually after years. If you are looking for a material which is easy to clean, you should consider having laminate flooring for the bathroom. This material is protected by wear layer from different types of woods and stones. It results in high durability that can reach up to 30 years of use. Laminate flooring is also resistant to moisture, but it isn’t necessarily a waterproof option. Linoleum is made from natural materials which possess some properties of the antimicrobial agent. For that reason, this material is highly resistant to molds or mildews. Its resilient features also become the reason why linoleum is included on the list of best bathroom flooring these days. All those good qualities make linoleum more expensive than most flooring types. Elegant and durable, natural stone is a good flooring option for any bathroom design. This material also gives a great value to the house, especially if you want to put the house on sale in the future. In line with its high value, natural stone flooring is relatively expensive. Additionally, you need to simultaneously install a radiant heating system to reduce the floor coldness. Coming in a wide array of sizes and colors, pebble tiles offer a contemporary style of bathroom flooring. In general, this material is made from stone, but there are some newer varieties which are produced from recycled glass. Once the tiles are installed, remember to keep them spotless by regular cleaning. Also, you need to raise the budget when choosing this flooring, because it may cost you higher than some other flooring types. Porcelain belongs to the ceramic tile family. Just like ceramic, this material is also one of the most popular shower floor options. This is because porcelain comes with several advantages. In addition to its stylish feature, porcelain is solid, waterproof, and more importantly, affordable to install. However, it is much slippery in the wet condition, so you may want to rethink about the safety factor. Rubber has various colors and patterns, so you can adjust it to suit your bathroom design. Moreover, this flooring material comes in both tiles and sheets, enabling you to choose the easiest type for installation according to the setting of your bathroom. Despite its practicality, rubber tends to look dull as flooring. You need to apply bright finished layer once this material is installed. As a bathroom flooring, solid hardwood provides natural warmth as well as elegant look. Unfortunately, this material is not a good match for the frequently used bathroom which produces a lot of moisture. Frequent contact with water tends to make this material bending and swelling. Terrazzo is made from the combination of granites, marbles, and glass chips. This material is usually used in a bathroom with minimalist design, so it can also be chosen as flooring for small bathroom. In addition to having high durability, terrazzo offers modern design and clean feature. It is also resistant to water, stain, and bacteria. The only weakness this flooring has is probably its high price. For decades, vinyl has been known as a luxurious flooring material for the bathroom. It also comes in various sizes and styles, making you easier to go with any bathroom design you like. In spite of this, vinyl bathroom flooring will not look good if the bathroom has gapped seams or poorly laid floor layers. Understanding the characteristics of different flooring types is a good first step when designing a bathroom. Now you can choose one from thirteen types of bathroom flooring above before planning the other design options, including color, texture, and dimension. Once everything’s settled, the flooring installation can be started, so that you can get the ideal bathroom design you’ve been dreaming of.